Mission: Our passion is caring and listening - empowering people to make positive life changes. We do this by connecting people with critical resources. Objective as a non-profit organization: we offer an array of support services available to everyone in King County. Our objective is to provide immediate and confidential assistance, including information and linkage to community resources, for people in emotional distress and in need of help. 24-hour Crisis Line offers immediate help for people in emotional crisis. It is one of the oldest 24-hour crisis lines in the nation and is accredited by CONTACT USA, which is an organization establishing industry standards. 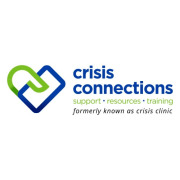 The Crisis Line is a unique resource for those considering suicide and for family and friends of persons with mental illness. The Crisis Line is staffed by volunteers, all of whom complete more than 60 hours of professional training before they begin to take calls. Mental health professionals supervise volunteers during each shift. Phone workers talk with callers about their concerns, help them sort through their feelings, explore coping strategies, and make appropriate referrals for additional assistance. Service is available 24-Hours a day, 365 days a year. Internship and Service Learning opportunities are available to undergraduate students. WA Recovery Help Line offers support and referrals to services for people needing chemical dependency, problem gambling and mental health help. WA Warm Line offers peer support to people living with a mental illness using the principles of recovery to enhance the well-being of callers. Warm Line calls are answered by people who are living with a mental illness and who want to share their experience to empower others. Teen Link is an anonymous, confidential and non-judgmental helpline for teens that is staffed by teens. The line is open from 6pm-10pm every night. Teen Link's motto is "teens empowering teens." Would you recommend Crisis Connections? The WA Recovery helpline is a great place to get experience well being a service to the state of WA! I wouldn't trade my experience there for anything! Highly Recommend! The Recovery Line is a great resource for the community. Volunteers can gain valuable experience learning about the ins and outs of the recovery system in Washington State.